It was noted that the municipal lagoon had serious problems with a sludge mound that rose above the water level. It was a concern that such a build up would block up and cause lift stations to backup. Vibank was quoted $60,000 to dredge out the lagoon to manually remove the sludge. After an application of 4500 lbs of product the operator noticed a huge difference and it was working well beyond his expectations at a significantly reduced cost, saving the village $45,000. 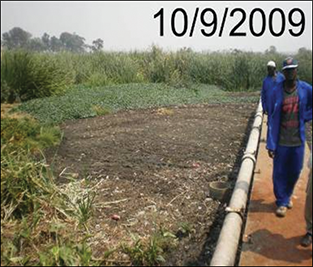 The 500 sow farm had over 7 feet of sludge built up over 3 years. They were looking at costs of agitation, pumping the water and dredging the solid sludge costing over $40,000. They applied 350 lbs. over the first 6 months reducing the sludge in half. Following 6 months of applying 250 lbs., the lagoon was completely clean. Then they continued to treat the system with 250 lbs. per year to maintain the clean lagoon. Five years later with continued treatment the system was free flowing and easy to clean which allowed for easy pumping, saving them over $30,000. Over the years many Anaerobic Digesters in Paris France have treated its sludge with our products. With the average use of 0.04 kg/m3 costing on average $58,000 per digester. The use of our bio-augmentation products increases the rate of released gases which in turn were used to heat the sludge. This saved an estimated $500,000 per digester in heating oil costs used for heating sludge during it’s final treatment, for a total annual savings of $442,000. 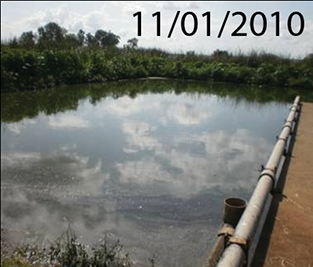 After four months, and a 168 kg application at a highly overloaded lagoon cell system in Chegutu, Zimbabwe. The cell was hydrolyzed and the outflow readings were significantly improved. The cost to the city was $8,400 saving the city $28,000, the estimated cost of manual removal, for a total savings of $19,600.